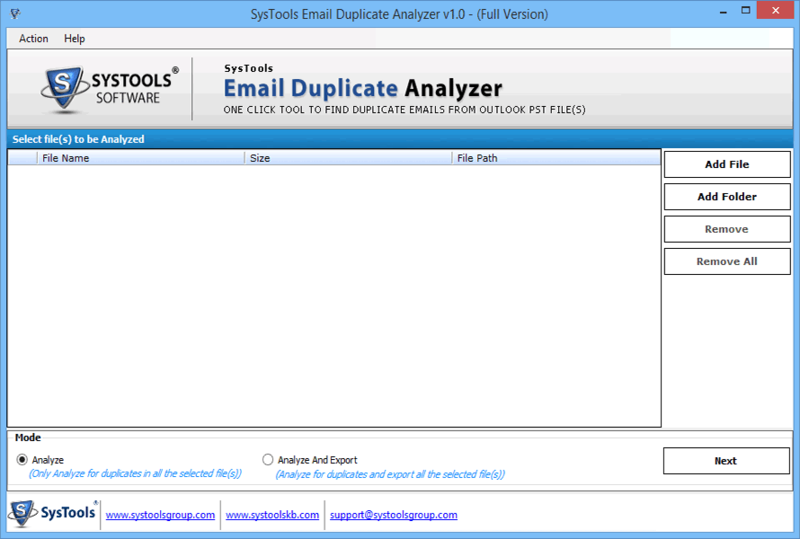 Outlook email duplicate analyzer permit you to find and remove duplicate emails from a single or multiple PST files. Select complete folder having number of PST files and the software will list duplicate emails found in those files. Analyze status of single or multiple selected PST files with analyze duplicate emails option. It scans and load details associated with Outlook data files like: file name, file creation date, number of duplicates and scanning status. After analyzing duplicates from PST file, export them individually. Select option to export individual PST file and the software will export entire selected PST files. Before exporting duplicate items has been removed from the data file. This option create single PST file by merging all selected PST files. This single PST file has emails of all analyzed PST files. Also software de-duplicate the emails while exporting the Outlook data file (.pst). Outlook duplicate remover provides an optional feature to export duplicate item in separate PST file. To do that you have to select Yes if you select No then you do not create a new PST file for duplicate emails. After analyzing and saving PST files, software will create a carry out action report of export and duplicates found. This report carries analyzed as well as export details of each PST files. The report automatically saved in CSV file format which will be used for future reference. Select PST file in order to remove multiple copies of single emails on selecting Add PST file/folder option. Extract duplicate emails from Outlook with the help of multiple features provided in Export Option. Also save duplicate emails at separate location. Free Demo of Email Duplicate analyzer preview complete process of removing duplicate emails in Outlook. Through trial vesrion you can access only analyze mode, which will gives status of total number of duplicate. Know How to Remove Multiple Copies of Single Email within Few Steps!! Watch the video that will demonstrate the working procedure of application. Email Duplicate analyzer find, analyze duplicate email in Outlook and finally remove/save duplicate email according to the choice. Apart from this application has come up with two advanced way of scanning PST. One is Across PST files and another one is within PST file that can eliminate repeated emails considering multiple PST simultaneously.